We do not accept applications from Miami-Dade County. We do not adopt dogs in homes outside the State of Florida. We need a valid email address in order to process your application. We do not adopt dogs to families with children under the age of 12! we have a representative in your area before filling out an application. We strongly urge you to read our Adoption Policies before filling out an online adoption application so that you can better familiarize yourself with our guidelines. We usually adopt our dogs to families that reside along specific regions of the east coast of the State of Florida. A mandatory home visit is required before placing any of our dogs. We do have a few Florida Yorkie Reps located in other areas of the State, so if you would like to know if we have someone in your area before filling out an application, please email us first. We do occasionally make exceptions to this rule for people who are either looking to adopt our "special needs" dogs or for homes that rise above our typical criteria for adoption and are also willing to make the trip here if they are approved. IF YOU RECENTLY MOVED TO THE STATE OF FLORIDA, YOU MUST BE A RESIDENT FOR AT LEAST ONE YEAR BEFORE APPLYING FOR A DOG FROM US. WE DO NOT SHIP OUR DOGS AND WE DO NOT ADOPT OUTSIDE THE STATE OF FLORIDA! Step 1: Fill out and submit an adoption application. If interested in adopting with Florida Yorkie Rescue please fill out and submit an adoption application. We suggest you do this FIRST. By being able to "see" your application first allows us to specifically answer questions in regards to YOU and your home and if the pup in question may be a match for you or not. Submitting the application first also allows us to pre-approve you before a pup that is a match becomes available. This also means you won't miss out on a pup. Please be sure you fill out the application completely. We can not process any applications with missing info. Your Vet's telephone # is vital!! Step 2: Review of your application by Florida Yorkie Rescue. We will review your application to determine if you and your home seem like a good fit for one of our pups. Since we receive many applications each day, not all applications will proceed. Our goal is to find the very best homes that are both safe and happy forever homes suitable for the small pups entrusted to us. We appreciate your understanding should you be eliminated as an adoption candidate. Florida Yorkie Rescue WILL DO A VET CHECK! This is to verify your veterinarian is as listed on your application. This too also ensures us that your current pets are up-to-date on ALL vaccinations, are on monthly Heartworm preventative medication and are spayed/neutered (we will not place one of our dogs in a home where there is another intact animal). If you do not have a pet, we will verify that the vet you have selected exists. Florida Yorkie Rescue will contact you directly to conduct a phone interview consisting of questions about you, your family, your home and other scenarios to determine a suitable match, if any, for your home. This typically occurs within 30 days. if there has been no personal contact within 30 days, your application has most likely been sent to archives. Please keep in mind that we are volunteers working other jobs. The more pups we have in the busier we are and the longer this may take. Please try to be patient with us. The final step of the approval process is a home visit. A volunteer comes to your home to determine if it is safe and acceptable for a small dog. This is usually done by one of our foster moms when we feel we have a match or when we will be in your area. If we can not conduct the home visit ourselves we will attempt to find a volunteer to help us. This could take days, weeks or even months. Once you are approved there are a few ways we proceed. If there is a specific pup in mind and we feel there is a match we will arrange for a meeting. If not we will contact you when new pups are coming in to discuss if one of them might be a match. If no pups are currently available or are a match you may also keep checking our site for a pup that interests you. When you see one that you feel would be a fit please let us know right way. If we feel the pup is also a good fit we will make arrangements for a meeting! We know this seems like a lengthy process but anyone who has adopted through us knows the efforts were well worth it! Adopted pups seem to know they have been given a second chance and there is nothing like the love they give! If you are looking for a young, small, healthy dog, we have an abundance of homes looking for the same thing. There will be many applicants disappointed as we rarely get this dog coming into F.Y.R. We hope the people looking to adopt through F.Y.R. are here for the right reasons and are not looking to get a "perfect yorkie" cheap. Florida Yorkie Rescue is NOT a shelter. All pups are fostered in private homes. Our foster homes are on a volunteer basis and all work other full time jobs and have families. We can not accomodate visitation of our yorkies for all the inquiries we get on each dog available. This would set up many disappointed families as there are many applicants for each pup available. Once your application has been approved, we will set up an appoitnment to do a home visit at which time we will also bring a yorkie with us for a "meet and greet." We give preference to homes with Yorkie, small dog or terrier experience. It is a common misconception that because a dog is smaller, it is easier to care for. Often the opposite is true. Certainly they are not as easy to house train and need homes that understand they cannot be left for long periods like larger breeds. People who have owned a Yorkie in the past already know this all too well and will be given preference. We do adopt to homes without experience who fulfill our other criteria and understand the needs of small breed dogs. We very rarely place Yorkies in homes with children under 12 years old and never dogs under 6lbs. If you are looking for a smaller Yorkie your children must be older. Some of the larger dogs we get in will do well with children if the dog is young enough to adjust or was raised with kids previously. We do make exceptions for those types of dogs only. But keep in mind, many of our yorkies were surrendered to us because children are now part of the home and the dog is NOT adjusting well. Our foremost concern is for the safety of the yorkie, but also for your child's safety as well. Florida Yorkie Rescue requires that all your current pets be spayed or neutered, up-to-date on rabies and distemper, heartworm tested and on prevention. We do accept titering of vaccines as well. If it is found that the current pets are not in good standing at time of vet check, the application will not processed. We do not support backyard breeding of any kind and believe that it is in an animal's best interest to be altered. Heartworms kill and it only takes one bite from an infected mosquito to infect your dog. We want all dogs placed through Florida Yorkie Rescue to be kept on preventatives and believe strongly that the way you care for your current or past pet sets a precedent with regard to how you will care for the one looking to be adopted. We prefer homes with fenced in yards. While this is not necessarily a strict requirement, we firmly take it into consideration when processing applications. If you meet all of our other criteria but don't have a fenced yard, we will process your application. If you meet none of the other criteria an unfenced yard is another minus. A "fenced" yard is that which would be small dog safe. Meaning that a small dog could not get out of the yard and other animals could not get in. Partial decorative type fencing is not considered a "fenced in" yard. Applicants must be 24 years old or more. At a young age, there are so many aspects of life that can change: a new career, a new home/apartment, a husband, children, etc. With these changes, dog ownership becomes challenging and sometimes impossible. Many of the dogs being surrendered to Florida Yorkie Rescue are coming in for exactly these reasons. It is unfair that we would put them back into a situation that is likely to change for them yet again. 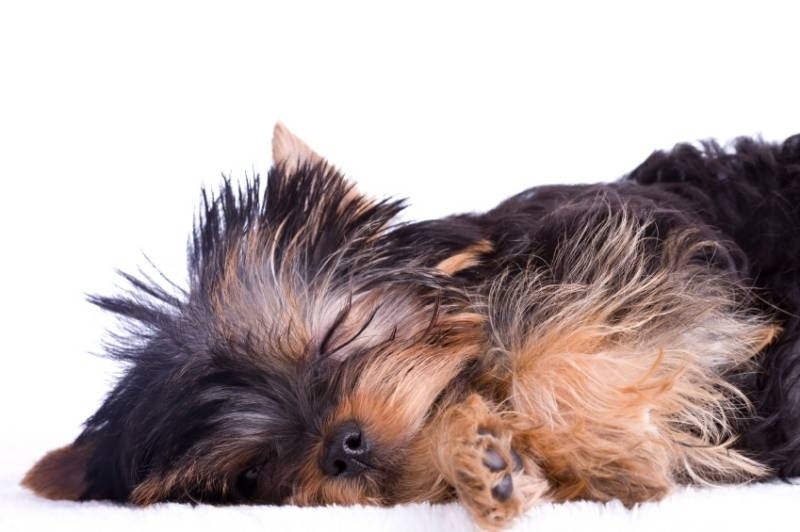 We are not insinuating that a young adult is a bad pet owner but just feel that re-homed Yorkies have very specific needs and it takes a very stable environment for them to thrive. We always prefer a well established house hold for our dogs. You must have a vet. If you do not have a pet, we still require that you have given this enough thought to select a vet. In addition, if you have owned a pet in the past, we need to know where you took that pet for vaccinations etc. This is part of the veterinary reference check which must be completed in full. It helps us to know that you have established a Vet even if you are not using one currently. You must have access to a computer. All applications must be submitted via our website and if approved, it helps to watch our site regularly to find a dog who matches your home and for us to be able to contact you before posting new pups coming in. Contacting you via email is the best time saver when time is so tight with our volunteers. This also allows us to send updates and pictures both ways. In addition, you will be contacted via email to set up your phone interview. We do not reserve or "Hold" dogs. We will not "Hold" a yorkie once it has been established that you are approved to adopt that pup. In the past we have been asked to "hold" a dog until after a vacation or move etc. or "until next weekend." this takes up very limited space in the foster home and as a result other pups needing us are turned away. This is not fair to those most in need....those still needing to come in to Florida Yorkie Rescue. Therefore if this is the case that timing is not right we will need to pass on your application and find another home. Please let us know if you are not actively seeking to adopt right away or if you have a time frame when you will be away. INFORMATION ABOUT OUR DOGS: FYR makes no representations or warranties regarding the temperament or physical condition of any adoptive Yorkshire Terrier. All veterinarian care and expenses are the responsibility of the new owners upon contract completion. All warranties, including implied warranties of merchantability and fitness for a particular purpose, where they are applicable, are hereby specifically disclaimed. With this said, we do provide adequate medical care as deemed by our Veterianarian for all of our dogs upon intake. FYR shall not be responsible for any bodily injuries or property damage caused by any adopted Yorkshire Terrier or by the actions of its adoptive owners. The adoptive owner hereby specifically assumes sole responsibility for, and agrees to hold FYR and its representatives harmless from, any and all loss and expense (including legal fees) by reason of liability imposed by law upon FYR and its Rescue representatives, because of bodily injuries to any person or persons including the adoptive owners, or any damage to property arising out of consequences of the placement of this Yorkshire Terrier, howsoever such injuries or damage to property may be caused, or may be alleged to have been caused by negligence of the aforementioned parties or any of their employees, agents, members or any other person. If you are looking for a tiny young healthy female yorkie, that seems to be what we are asked for most often. We do get them in every once in a great while but we also have a waiting list for them as well. Females in rescue will likely be adult or senior dogs or have health issues. It is more common to find an adult or senior dog or one with health issues. If we have a healthy, young small yorkie available, it is a rare occurrence and there are over 40 other people who want the same dog. If you are looking for a young dog, don't expect him to be a "lap dog". Young dogs want to run, go for walks and play. An adult or senior will be more likely to be a "lap dog" and are usually better behaved. Re-homed pups need and deserve your patience whether it be house training, getting along with the other pets or just settling in. Be prepared. Yorkies are expensive dogs to own - they need grooming often. They also need their teeth cleaned often, sometimes annually and because of their size, also expect to see the vet more often. There is an adoption donation applied for each pup. This donation varies based on the gender, age, size and health of the dog. All adoption donations received goes directly to the vetting of our pups - no person is compensated for their volunteer services to this organization. Please be sure that you are applying for the right reasons and not just shopping for a less expensive, perfect representation of the breed standard. If this is what you are looking for, please find a very reputable breeder. PLEASE DO NOT BUY A YORKIE FROM A PET STORE. Pet store puppies come from puppymills- ALWAYS and no matter what they tell you. No reputable breeder would put their puppies in a pet store. While these are the basic guidelines, we can at any time, deny an application because we know that there is no dog in Florida Yorkie Rescue that would fit the environment. Please do not take this personally. Your home may be perfect for another breed! Thank you for wanting to adopt first. If you do adopt a pup through Florida Yorkie Rescue, you won't regret it! We receive many emails daily about dogs we have for adoption, the questions are usually very much the same. Below is an outline of our adoption procedure to help answer some of these questions. Because we are so small we do not have the man power to answer questions from those not serious enough about adopting to submit an adoption application first.